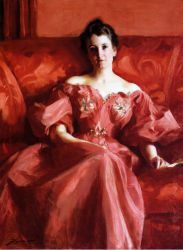 Alfred Émile Stevens (May 11, 1823 - August 29, 1906) , Belgian painter, was born in Brussels.His father, an old officer in the service of William I of the Netherlands, was passionately fond of pictures, and readily allowed his son to draw in the studio of François Navez, director of the Brussels Academy. 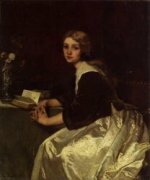 In 1844 Stevens went to Paris and worked under the instructing of Camille Roqueplan, a friend of his father's; he also attended the classes at the École des Beaux-Arts, where Ingres was then professor. 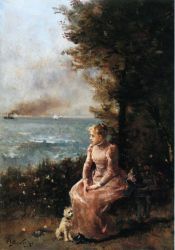 In 1849 he painted at Brussels his first picture, A Soldier in Trouble, and in the same year went back to Paris, where he definitely settled, and exhibited in the Salons. 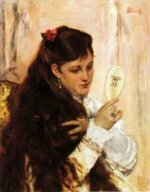 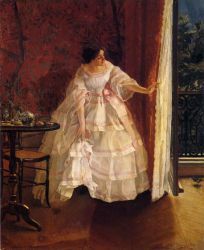 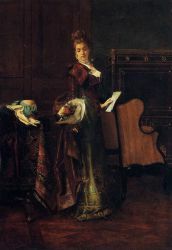 He then painted Ash-Wednesday Morning, Burghers and Country People finding at Daybreak the Body of a Murdered Gentleman, An Artist in Despair, and The Love of Gold.In 1855 he exhibited at the Antwerp Salon a little picture called At Home, which showed the painter's bent towards depicting ladies of fashion. At the Great Exhibition in Paris, 1855, his contributions were remarkable, but in 1857 he returned to graceful female subjects, and his path thenceforth was clear before him. 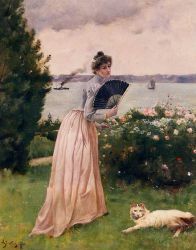 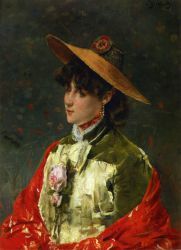 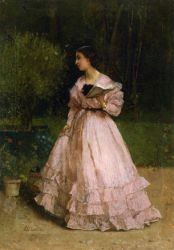 At the Great Exhibition of 1867 he was seen in a brilliant variety of works in the manner he had made his own, sending eighteen exquisite paintings; among them were the Lady in Pink (in the Brussels Gallery), Consolation, Every Good Fortune, Miss Fauvette, Ophelia, and India in Paris. 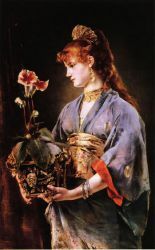 At the Paris International Exhibitions of 1878 and 1889, and at the Historical Exhibition of Belgian Art, Brussels, 1880, he exhibited The Four Seasons (in the Palace at Brussels), The Parisian Sphinx, The Japanese Mask, The Japanese Robe, and The Lady-bird (Brussels Gallery). 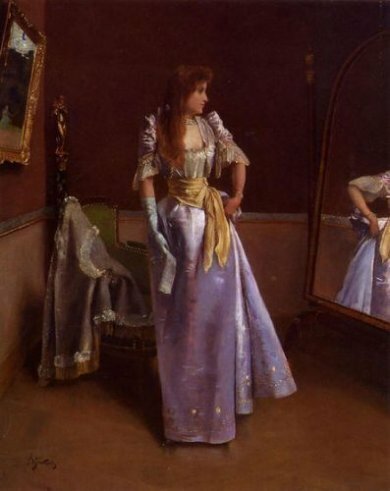 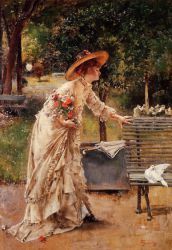 "Alfred Stevens is one of the race of great painters," wrote Camille Lemonnier, "and like them he takes immense pains with the execution of his work." 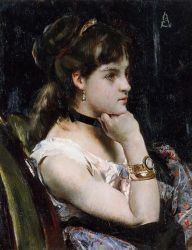 The example of his finished technique was salutary, not merely to his brethren in Belgium, but to many foreign painters who received encouragement from the study of his method. The brother of Alfred Stevens, Joseph Stevens, was a great painter of dogs and dog life. See J. du Jardin, L'Art flamand; Camille Lemonnier, Histoire des beaux arts en Belgique.